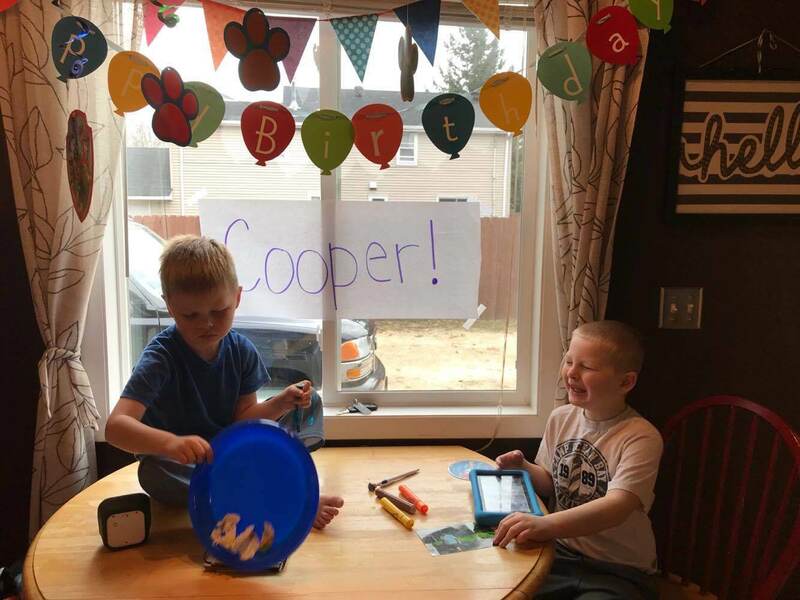 I wanted to give an update about Cooper’s birthday party! Overall, it went great. He did so well. He spent the majority of time on his Kindle and doing his own thing and after nearly seven years I can honestly say…that’s okay. Birthday parties in the past have been very stressful for Cooper and ultimately very stressful for mom and dad. They were especially hard at age two and three, pre autism diagnosis. Cooper didn’t want to be around people. He didn’t enjoy parties or noise or food or presents or games. He didn’t eat with his guests. He didn’t open their presents. He would spend the whole party glued to a television set. Often, I wondered if he even knew guests were in his house. I remember my heart being broken once or twice after a few of his parties. I would be the one that opened the presents. I would watch my friends kids be so excited and ultimately play with his presents. I remember him doing quite a bit of head hitting during the birthday song. I remember hiding my tears and being covered in sweat. It was all hard. I remember spending days after the party grieving. The differences between Cooper and his peers were blatantly obvious on those days. I remember being so sad and people almost scolding me. They’d say things like…who cares if he has a party. You’ll save money by not having one. Or, take him and celebrate him in his own way. I remember smiling and thinking…I don’t know how to do that. My kid doesn’t like to do anything. He only watches Thomas and Barney. He doesn’t even know what a birthday is. 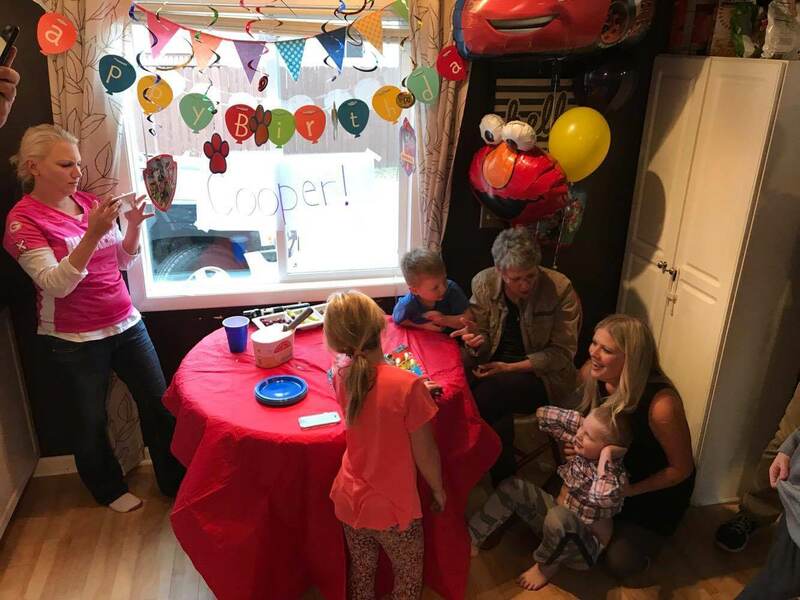 I still find Cooper’s birthday to be very emotional for me…and in a far different way from…’you are growing up so fast.’ I feel like birthdays are a reminder of everything we have missed. And we’ve missed a lot. We have no words. And in a way, I sometimes feel like we are running out of time to experience them. I remember thinking, this is fine. 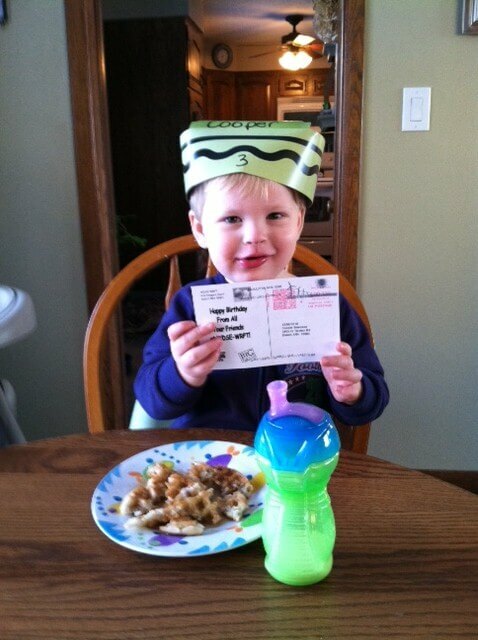 Nonverbal at age three is fine. There is still time. And then, nonverbal at age four is okay. He can still catch up. I stopped thinking that around age five. Age five was big for us. I had a lot of self reflection, grief and acceptance. Age six was better. We were in a far better place now. Today, we had a small family party that we started preparing Cooper for weeks ago. 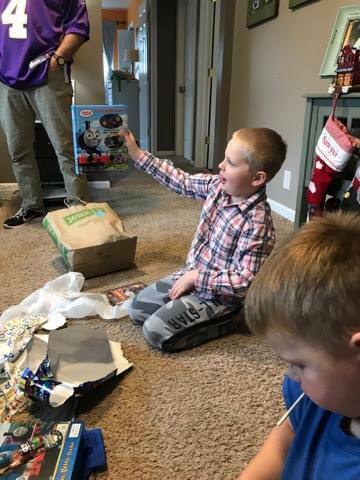 I was pretty excited because this was the first year he seemed to understand his birthday. It was the first year he wanted a party. He requested (with his talker) a cake, party, balloons, family, decorations, and presents. He pushed the present button ten times! It was a busy, chaotic, autism filled, joyful day. We celebrated Cooper the exact way he wanted to be. Quick and painless. Coops waited patiently in the window for his quests to arrive. 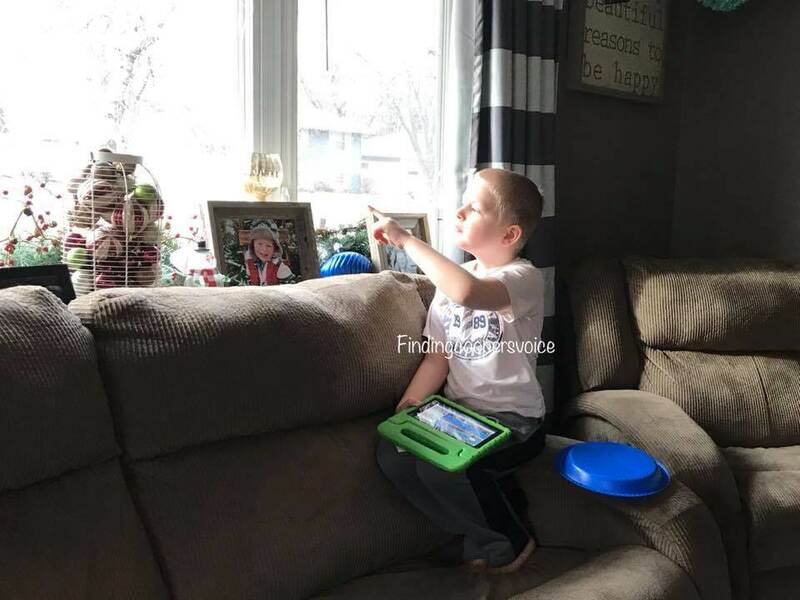 He squealed and pointed at every car that drove by. Every time either Jamie or I walked by him we had to reassure that his party was still happening. He also held onto blue plastic plate. He seemed to understand that it was for the party. Cooper greeted each of his guests as they arrived. When Cooper was younger we used to invite my friend’s kids to his party. Many of them are the same age. Around age five we started inviting only family. The pressure of kids was just too for him. Too much noise and chaos. He also doesn’t engage with children in any way so it didn’t make a lot of sense. Today, Cooper wandered throughout the party on his Kindle. He showed people his train movies with squeals and smiles. He waved and got people’s attention. He laughed and danced. Once all of his guests arrived he immediately grabbed his talker and typed in three simple words…’I want presents.’ The whole group got a good laugh from that one. I think that was the first time in Cooper’s life I had the funny kid. My heart melted. In the last few months Cooper has started showing interest in presents. The first present he opened was from me. It was a train video called, Lots and Lots of Trains. He immediately wanted to go to his room and watch it. It was pretty hard to get him interested in opening the rest of his presents. He is so sweet and simple. He knows no greed. One present is all he needs. After presents the rest of us ate dinner. Then it was birthday cake time. This is the part that is the hardest for Cooper. 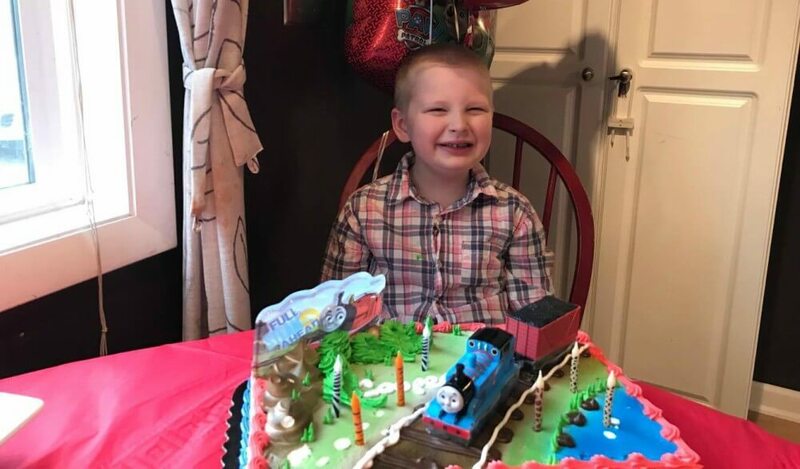 Cooper loves cake…especially HIS Thomas themed cake. And he loves the birthday song…especially when it is sang in one of his movies or TV shows. He also really, really loves having all of his favorite people in one room. But, it’s a lot different in real life for Cooper. Things that he really loves often bring him a lot of stress. I knew he would probably do some head hitting and screaming if we sang to him. This year we decided to encourage him as much as possible without causing him too much stress. It’s a fine line people. He wanted to song. He wanted the cake. So, we did it. He covered his ears, wiggled, squirmed and tried to hit his head. I think we sang the whole song in five seconds. The second we were done singing he immediately clapped and smiled. My little birthday boy. Could he be any cuter? 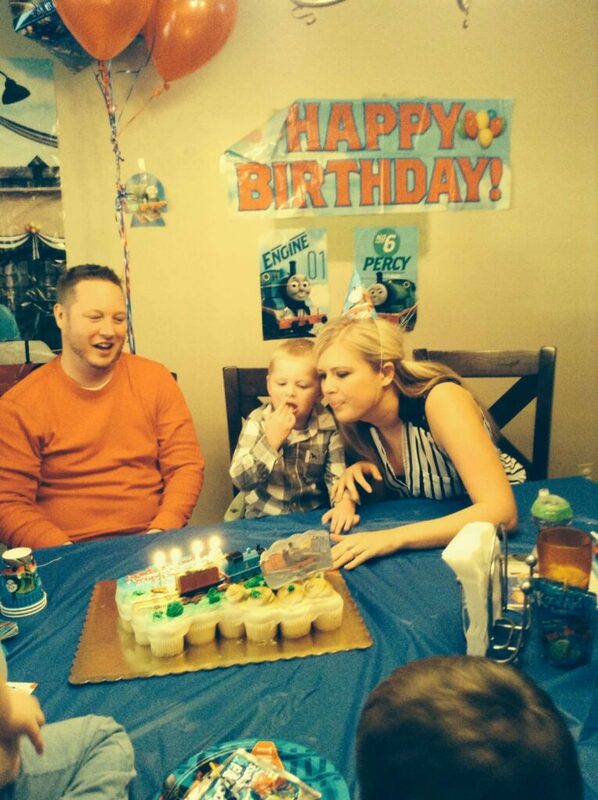 Here are a few pictures from Cooper’s previous birthday parties. They were mostly stressful. Besides age one they were all Thomas themed. Same decor. Same cake. Same everything. Some years we sang. Some years we didn’t. The older he’s got the less of a ‘to-do’ we make it. That’s just how it goes. I realized the parties weren’t for him. They were for me. I’m not saying it didn’t make me sad. Because it truly did and does. But I stopped putting pressure on him. If he didn’t want one then we didn’t do it. Simple as that. You should all probably expect a few sappy birthday themed posts this week from me. I can tell it’s brewing!